Let’s face it, not everyone has a sizable budget for promotional items. If you’re like me, there’s been a time in your life when you’ve had “SWAG Envy.” Someone else at a trade show, maybe even a competitor, had a more expensive, trendy giveaway item making their booth the talk of the show. There are worse things in the world, but let’s be honest…it’s a total letdown. Here’s reassuring news: I’ve seen people spend ridiculous amounts of money on items and not generate a single sale out of their investment. I’ve also seen people spend a modest amount of money on less exciting items and achieve a fantastic return. There are any number of cool giveaway items out there, but remember that your end goal with a promotional product is to become top of mind. In other words, you want to generate Brand Recognition and beyond that, Brand Recall. What really matters most then is the Total Number of Impressions created by the item. I bet you can think of at least one promotional product you received that seemed so exciting but ended up being a bust. I once received a handsome golf towel from a vendor that was new to my industry. It was made from a premium, soft velour material and featured an amazing full-color design. The problem is that while I appreciated the expense that went into the towel, I don’t really play golf, so I think it sat hidden in my garage for a while before it was moved to the donation pile. I couldn’t have told you anything about the company that gave it to me, so you can imagine the ROI on that product. Now let me contrast that with a lower-priced item that still catches my attention day after day: A sticky-note cube. It may sound pedestrian, but I bet if I did a survey of workplace desks right now, 50-75% would have a block of these handy notes on them. In fact, there’s a half-used cube on my desk as I type this. This one happens to be printed on all four sides, as well as on each individual page. 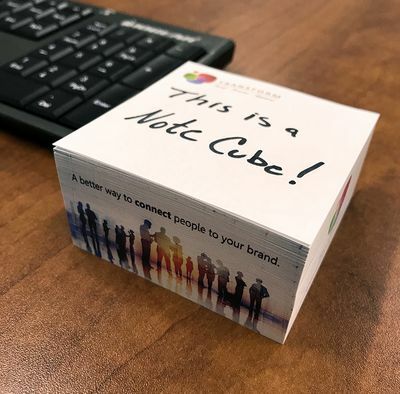 I’m certain the investment was relatively small, but this cube, which features the company’s logo and contact info, has been sitting on my desk, in my line-of-site, 40+ hours per week, for the past two months. The point here is that the Total Number of Impressions, and consequently the ROI on promotional items, is driven by the lifespan of the item coupled with the frequency a person will see/use it. The next time you’re purchasing a promotional product, think about where your target customers spend the bulk of their time—at their desk, in a car, maybe traveling? That’s the place you want your item to be. Also, consider the utility of the item. Will your target market actually use it? How long will the item last? You’ll find many of the promotional products that fit these criteria aren’t necessarily expensive at all and consequently provide a really high return. And when your competitor visits a prospect and sees your logo on their desk two months after your trade show, guess who will end up with SWAG Envy?